Join Sierra Adventures on a snowmobiling adventure like no other, effortlessly gliding through the high Sierra winter wonderland on your own snowmobile. Intro: Snowmobiling provides the opportunity to explore various trails of the Sierra, as well as taking you to spectacular views of beautiful Lake Tahoe and the surrounding high mountains. We know where the best ride is for your particular taste. We can take you on wide open, point-to-point runs or on slow moving scenic rides with world-class views. The Tour: Your snow adventure begins with a pickup at any local hotel. We will help your group with any rental needs, then shuttle you to the starting point of your snowmobile adventure. 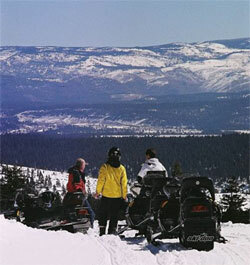 Snowmobiling can be combined with other snow-filled adventures through advanced booking.